Clark is driving the pick up through Hamilton County, late at night when a shady figure covered in blood steps into the road uttering "they are coming, help me" in Russian, he is... Kal-L, Red Son Superman! 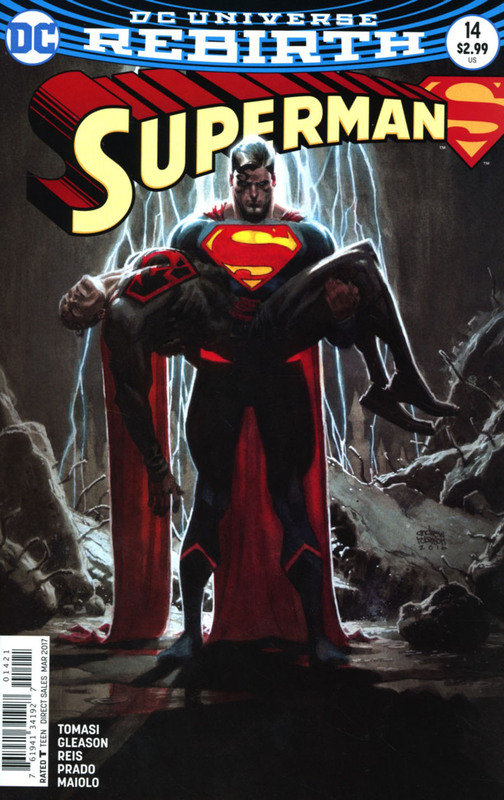 Weakened, he explains to Clark that someone names Prophecy is hunting down Supermen from other worlds. He escaped their clutches drawn to the fight between Superman and Swamp Thing (Superman Annual 1) though Kal-L doesn't know their motives he knows someone named Kenan Kong is their next target. The Gatherers, minions of Prophecy, arrive and attack Clark and Kal-L and they are barely able to fend off the attackers before more dimensional travelers arrive from the House Of Heroes. They are the Justice League Incarnate, sworn protectors of the multiverse. Their leader is Superman of Earth 23 (Calvin Ellis/Kalel). Clark agrees to lead them to China to find The Super-Man but the Gatherers find him first and attack! Despite the JLI's efforts Kenan is kidnapped from our Earth, whisked away and placed in a techno prison. Bizarro-Superman (Earth 29), Ultraman (Earth 43), Sunshine Superman (Earth 47), Lord Superman (Earth 50), Superwoman (Earth 11), Jon Kent (Earth 31), Superman (Earth 1), Superman (Earth 2), Super-Martian (Earth 32), Kingdom Come Superman (Earth 22), Superdoom (Earth 45), Superman (Earth 38) and Captain Carrot (Earth C). A large mechanical appendage pulls Captain Carrot from his cell and places him inside a glass cylinder. A painful process begins as the poor Captain is bombarded with some alien energy. And when he's released from the device he's become an infant buck held in the hands of someone sinister! Story - 5: After the two part S.H.A.D.E. soap opera, Tomasi and Gleason had to bring us something that would be a comics readers equivalent to a punch in the gut. When actually they went for a full on atomic wedgie. Did you squeal when Kal-L appeared? What about when Calvin and his team showed up? No? Then what about the Prophecy prison? Come on at least one of you agrees with me that this was all about the feels. It may have hints of Xenon and his mission to capture the multiverse Supergirls (go hunt for the Peter David series) but whether you loved or hated the Multiversity series a little while back you have to love the ramifications, and the 'Superman' title is fully embracing what that series was all about, in a good way. Hell even Lois & Clark touched upon this during it's Tempus episodes. Superman (our one) might not reveal much about his knowledge of the Multiverse to his allies here but both he and the reader knows full well he dealt with it many times before (most notably in between "Grounded" and "Convergence"). But hey putting aside scrutiny, what the team deliver is the beginning of a solid storyline. Is it bad of me not to be bothered about Kenan? Ah well, sorry, it's the other Supermen I'm more concerned for, because if they as a symbol vanishing (Red Son touches upon this) will severely jeopardize all of continuity. Art - 5: Love, love, love it! Initially it was all the tiny cameos and hunting through comics and Google trying to figure where I'd seen them before (like an old yearbook) but after all the neat easter eggs, when you truly immerse yourself, you get lost in the art, not through clutter or confusion but through atmosphere. I really felt like I was in Hamilton County watching it unfold. Reis & Prado have gone through great lengths to push the story beyond some of the more comedic and outlandish elements. 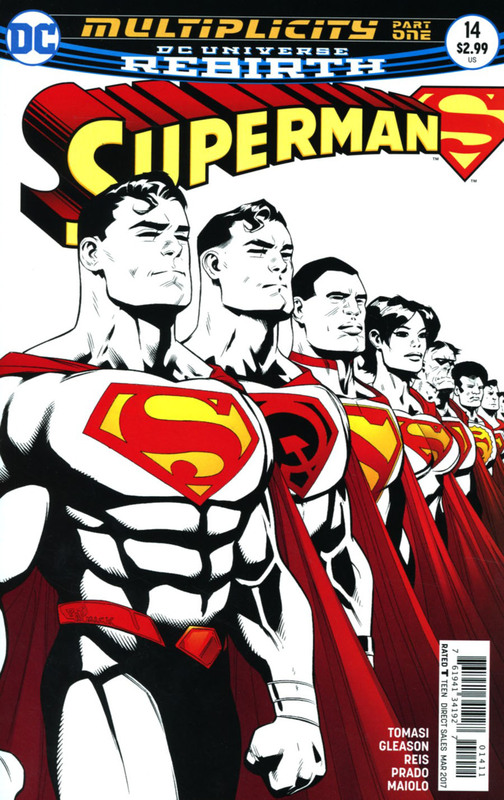 Multiplicity looks set to be one of Superman's most memorable stories and the new year has barely begun! Variant Cover Art - 5: Now this is a real 'shut up and take my money' cover. It gives the gist of the story, the urgency, the drama and on top of that the composition is evocative of the now classically famous 'Crisis pose' while also being beautifully painted.